Start The Evolution Without Me! | Beware–Here be random thoughts, pointless ponders, meandering moments and misfired synapses! 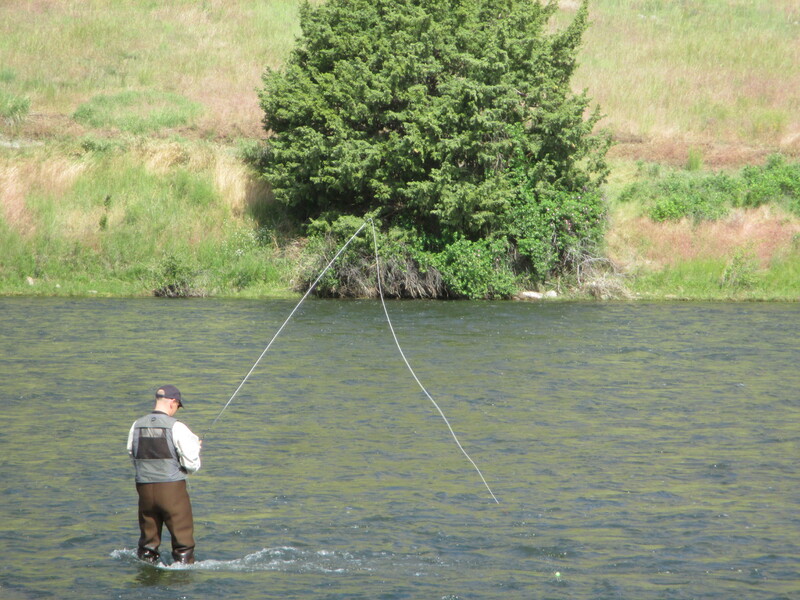 It’s that time of year in Montana when we couldn’t agree more with Henry James: “The two most beautiful words in the English language are summer afternoon.” Especially after this past winter, we’ve been thoroughly enjoying not just summer afternoons, but mornings and evenings, as well. We recently took a trip to a little bit west of Bozeman, to Norris Hot Springs (also known as “Water of the Gods.”) It’s been on our “want to visit” list (and that list could take a lifetime to complete; aside from the obvious places like Yellowstone and Glacier, there are so many hidden gems of places in this superlative state) for several years, but, in past years, by the time we get around to going, the temps are in the high 90’s, and who wants to sit in hot water then? So we planned this trip for late June. Like most good road trips, the journey itself was a part of the destination, and we were in amazing-grace awe at the scenery – the Crazy Mountains gloriously “decal-ed” onto the far-off sky, rippling golden fields of mustard beneath cotton-candy clouds, the dazzling green (thanks, actually, to all the snow – they call it “moisture” here – from this past winter), the slow-motion poetry of fly fishermen in the Madison River, the brilliant underbellies of white pelicans flashing in the sun as they circled on updrafts, and the surprise of blooming cactus (I guess it shouldn’t be a surprise, since we are in a high-desert area). Surely this was the kind of summer afternoon that Henry James meant, we surmised, when we arrived at a BLM campground near Norris. 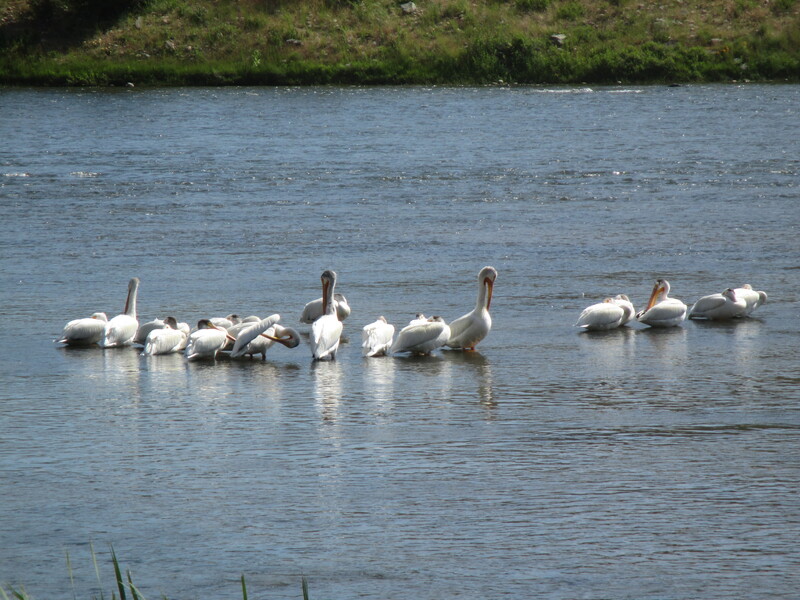 After setting up the tent, we enjoyed a lazy afternoon, reading in the sun and watching white pelicans soar about us. Truly, a quintessential summer afternoon. By late afternoon, we headed to the hot springs, planning to spend an hour or two, and then return to the campground for dinner. The first thing we saw driving into the parking lot at Norris was an incredible garden. We assumed that it belonged to the owners, or the space was rented by someone else. But, we were soon to discover that the garden produce is used at the cafe/restaurant on the grounds. 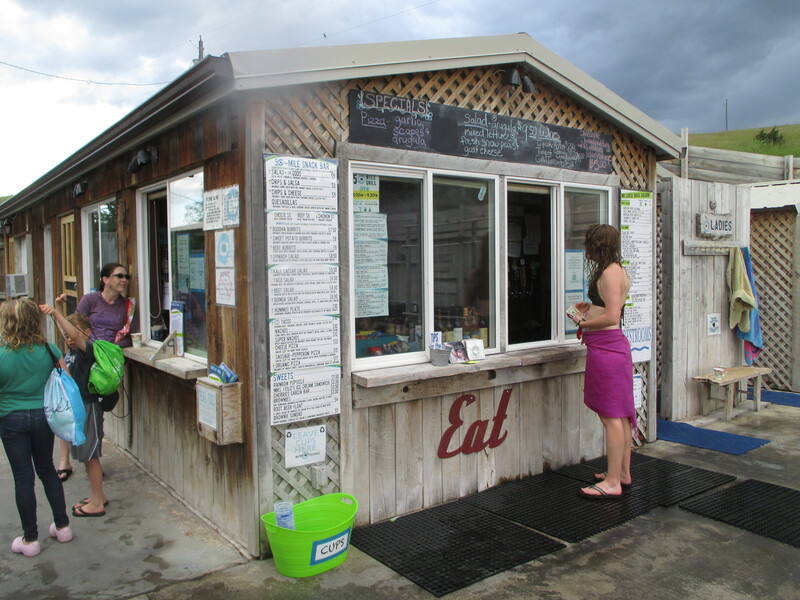 They’ve got a wonderful “50 Mile Grill” on the premises – named because they try, as much as possible, to source local food from within 50 miles. And the garden – about 50 yards away – was one such source. Their menu is a creative mixture of local burgers (Montana, grass-fed beef and bison) and steaks, local rainbow trout and lamb, burritos, tacos, nachos, and a wide variety of fresh salads. Order the kale Caesar salad, and you can watch it being made! Of course, there’s also locally-produced wine and beers. Naturally, our dinner plans changed. But first, we “took the waters,” where we met this evening’s musician, Shannon Wurst, and her boyfriend, Nathan. Over the course of the evening, we had a wide-ranging conversation with Nathan about … everything. Maybe conversation just flows better in hot water. It was a cloudy evening – even a tad cool – so the water temperature was perfect for relaxing, talking, moving around, and even eating and drinking. The pool is lined with wooden slats – kind of like a large wooden box – and all along the edges are wooden-slatted benches. And the cool part? You can order your dinner, take a number on a stick back to where you’re located in the pool, and your meal and drink get delivered to you – in the pool! With great music accompanying your in-pool dining. Really, the whole place is a kind of sensual overload, in a good way, with the water, food, and music. 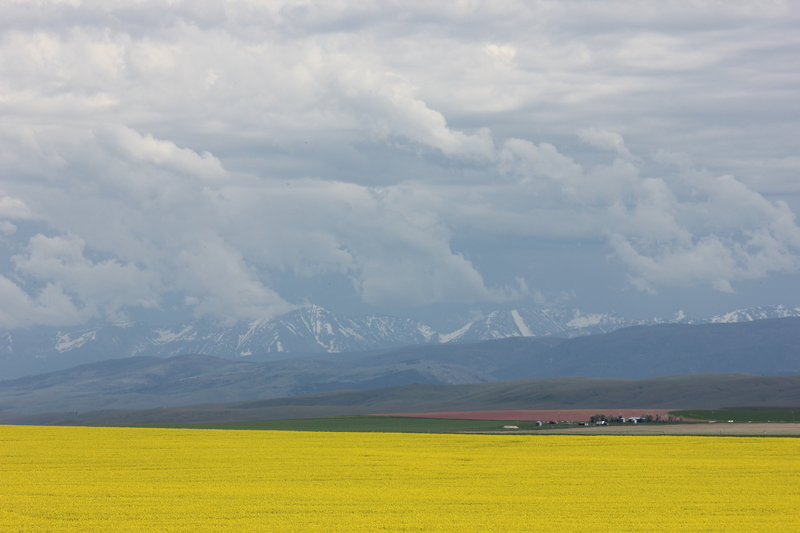 But there are also beautiful flower gardens and bird-feeders (attracting gorgeous yellow-headed and red-winged blackbirds) near the pool, wetlands and wildlife just beyond it, the sense of history from sitting in hot springs that date back to the 1880’s, and the satisfaction of watching the big Montana sky dissolve into twilight before twinkling stars pierce the darkness and reflect off this amazing geothermal water of the gods. 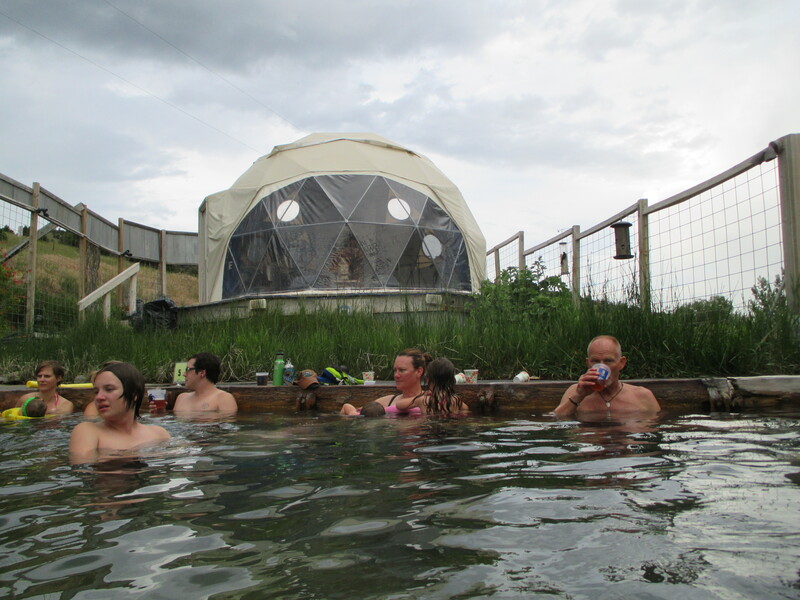 If you’re in the area, don’t miss a soak at Norris Hot Springs. Those of us who grew up in the 50’s and 60’s remember, with fondness, the ubiquitous Icebox Cakes. From what little information I’ve been able to find, Icebox cakes became popular in this country in the 20’s and 30’s (about the time that actual iceboxes were gradually being replaced with refrigerators), after initially being introduced to the U.S. – via recipes such as trifles and charlottes – during World War I. The recipe couldn’t be simpler. It’s two ingredients – the wafers and whipped cream. 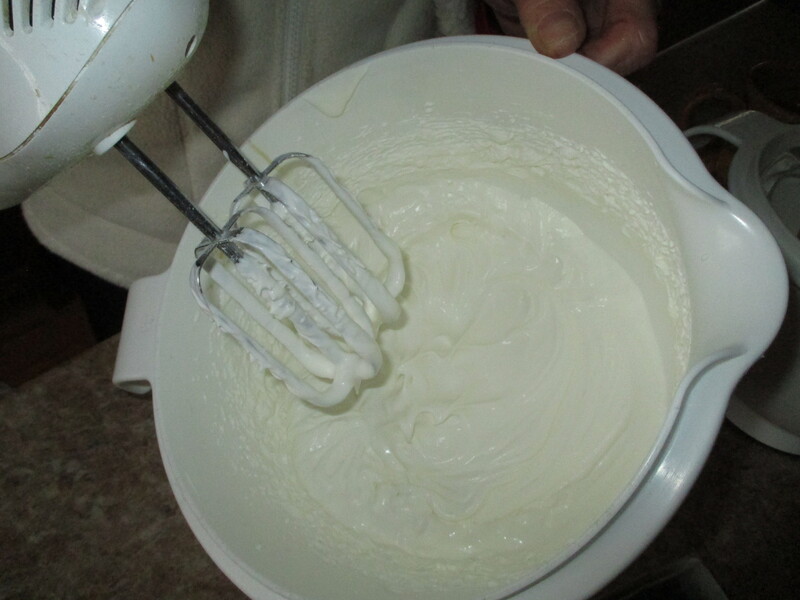 Be sure and get real whipping cream, and then whip two cups of it into medium-stiff peaks (don’t whip too long, or you’ll get butter). 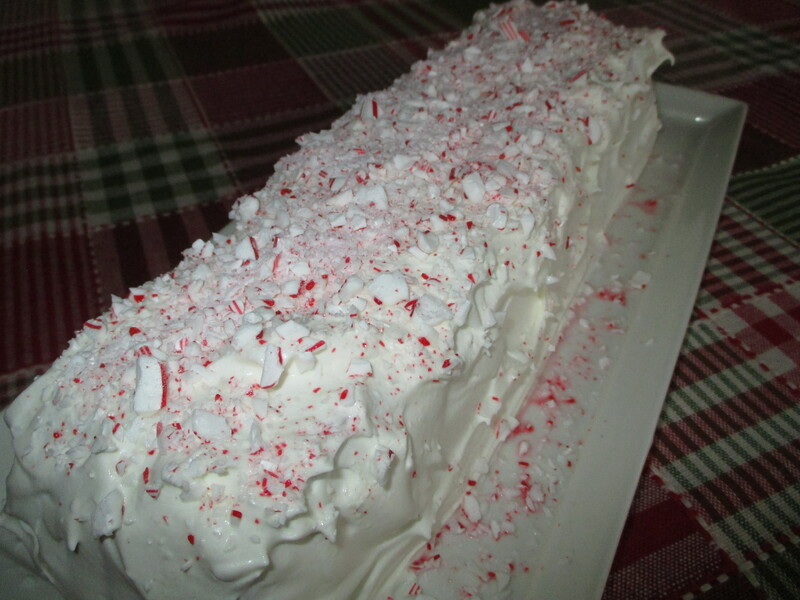 Get a long serving platter or plate, and spread a little cream down the center. 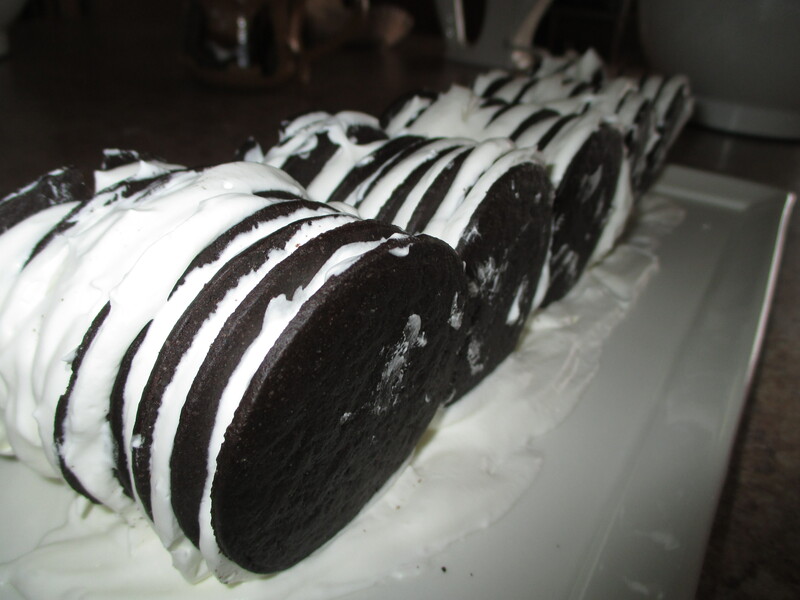 Then spread cream between about eight (or nine) wafers – make a little stack – and turn them on their sides. The wafers are very delicate and break easily, but unless they shatter into pieces, you can just stick the broken ones back together with the cream. Use up all the wafers like this. “Ice” this long “log” of wafers with the remaining cream. That’s it! 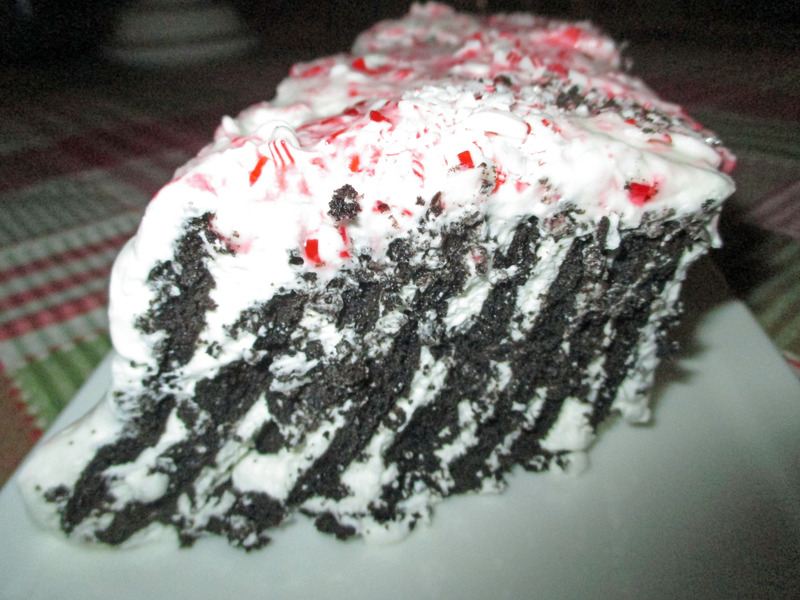 Since I made this over Christmas and since I love peppermint, I broke up some candy canes and sprinkled that on top, so this one was really made with three ingredients, not two. Now that I’ve re-discovered this simple dessert, I plan to make it more. It’s great in the winter, but I can see it as a refreshing treat in the summer, too. As a lover of words, one of my favorite is synergy – where the whole is greater than the sum of the parts – and I think it’s true with this icebox cake. It tastes way better than its (two) individual parts. If you want to go for a few more ingredients and a little more adventure, try this recipe for a chocolate chile icebox cake, or this one for a tiramisu cake. And this one looks kind of intriguing, too, in that it’s an individual icebox cake, and enhanced with raspberries. 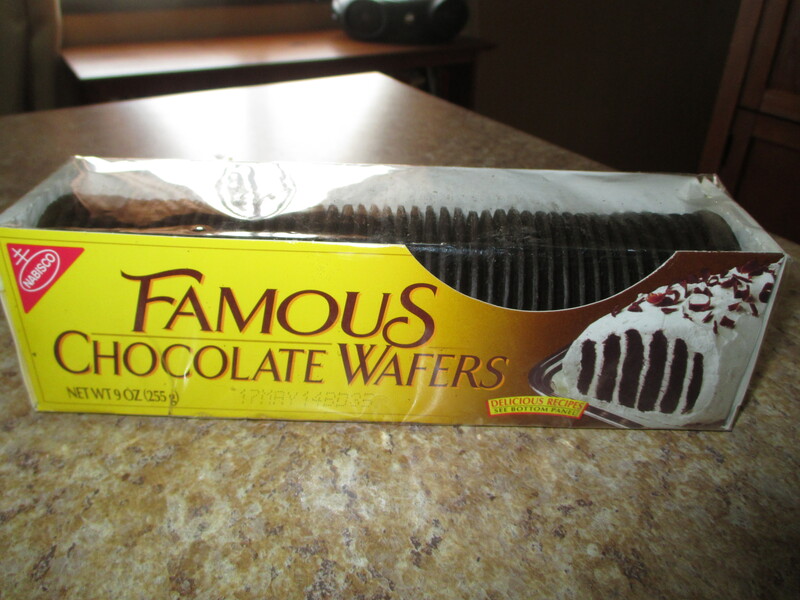 Barbara, can you purchase Nabisco Famous Chocolate Wafers in Mexico? And is there any kind of similar cake in your area? I’ve always loved tres leches cakes. Are those regional or national? 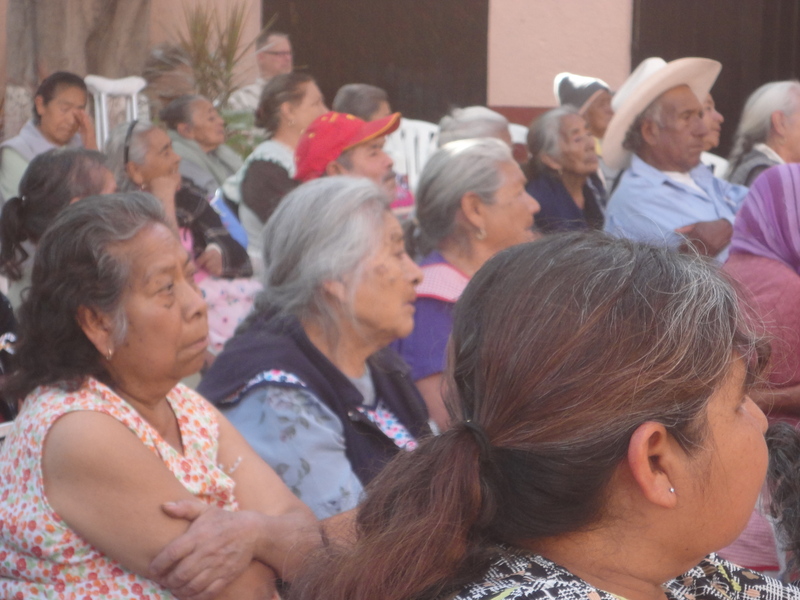 Phyllis, Kathi, and I are preparing for the Christmas posada for the old folks in Nestipac, Jocotepec, Jalisco, which is to take place this upcoming Wednesday, 11 December 2013. Kathi has done an inordinate amount of work on this since Phyllis has been extremely busy working on a new edition of her late husband Georg Rauch’s book, The Jew With the Iron Cross (http://www.amazon.com/The-Jew-Iron-Cross-Survival/dp/0595379877), and writing and giving a speech at the international book fair held annually in Guadalajara (http://en.wikipedia.org/wiki/Guadalajara_International_Book_Fair), and I’ve been my usual lackidaisical self. But somehow, as in years past, things seem to falling into place, and we’re all delighted about it. Our local gringo friends have once again come through for us in the form of donations of money and blankets and clothing, and our Mexican friends are giving their time, talents (dancing and music), and skills (in the form of making atole and tamales to feed the crowd). Yesterday it was my turn to make my contribution to the posada. I had volunteered to provide all the “paper products” for the event. This included styrofoam plates and cups, napkins, and large trash bags. Easily enough done, of course, but, by volition, done with a Mexican flair. Instead, for example, purchasing the cups and plates at Costco last week when Kathi and I were up there, we elected to purchase them from a Jocotepec vendor. Good for the local economy and, it turns out, a real-life example of trickle-down economics. By all standards, this should have been a rather mundane activity, but it turned out to SO not be one. Here’s what I wrote to my friend Ed about it this morning. Enjoy! Yesterday morning, about 8am, I went over to a little abarrote to purchase the styrofoam plates and cups that we need for the posada (we serve atole and homemade tamales, one pork tamale, one tamale dulce). Phyllis, my friend who “runs” the whole thing, said that we needed about 175 of each. We had some left plates left over from last year, but my contribution this year is to purchase all the “paper products” that we need. And since I like giving the local folks some business, instead of buying the things at Costco last week, I went over to the abarrote that my friend Antonio re-did for some folks a couple of months ago. (Wheels within wheels within wheels…..and the real ‘trickle down’ economics at work.) When I walked in, the guy working there dropped everything to wait on me, even though there was a young Mexican couple in front of me. “No, no,” I told him, “I am second. Please take care of these folks first.” And so he did. He disappeared into the back room and came out with a large baggie of absolutely clear liquid. I could NOT figure out what it was, so I asked the young man what was in the bag. “Vinegar?”, I asked him. He laughed and said “No, it’s alcohol.” Now I know for a fact that nobody buys rubbing alcohol in a plastic baggie and when he said it was “for cinnamon” I knew exactly what he was going to do with it. It was for a pajarete. (Google it if you don’t know what that means.) I’m thinking now that maybe the abarrote owner and/or the young couple thought I would be offended by it for some reason, which is why the owner wanted me to go first. Anyhow, having taken care of the young couple, the owner came back to me and asked me what I needed. I pointed at the 12-ounce styrofoam cups (25 per sleeve) and told him that I needed seven sleeves. The cups were on the very top shelf, so the owner got out a stick and started knocking them down into his hands, then laying them on the open containers of spices and nuts that he also sells. That being done, I told him that I also needed three 50-count packs of rectangular plates. Well, actually, I didn’t tell him that since I don’t have a clue how to say rectangular in Spanish, so I had to use hand gestures to indicate what I wanted. Having received what I wanted, we bundled the stuff over to the checkout counter (and I use the term loosely) and he proceeded to look up the prices and add up what I owed him on the calculator. He did this several times and I thought maybe he was having trouble finding the price for the 12-ounce cups since they also sell 8-ounce and 16-ounce cups. But, no, that wasn’t the problem. Finally satisfied with the total, he looked at me and said, very solemnly, “es mucho dinero.” I momentarily panicked since I had not asked the price of anything and I only had about 500 pesos on me. Have I told you lately how much I love Mexico???? 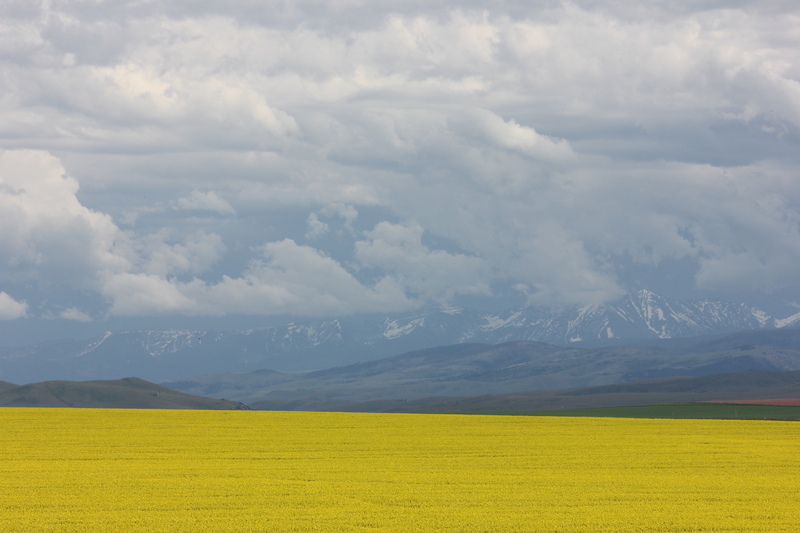 A couple of weeks ago, my friend Kathi and I went around the high hills (or low mountains, depending on your perspective) to the the north of Jocotepec to see if there were any wildflowers showing themselves. It was rather late in the year to be looking for them, but since we had had some rains in September and even a few in October, long after the rainy season usually ends, we thought we might find something. And so we did. Not just some wildflowers, but one of the most elaborate little cemeteries I’ve ever seen. If you travel a couple of miles north toward Guadalajara from Jocotepec on Mexico Highway 15, you’ll see a turn off for the little pueblos of Potrerillos and Las Trojes. And even though it’s only a short distance from Joco as the eagle flies, and even as the RAV4 drives, it’s a very different type of place. My friend Phyllis, who has lived hereabouts for many, many years, says that the little towns on the north side of the mountains remind her of what the north shore of Lake Chapala where we now live, used to be like 30 years ago. Lots of flowers right next to the main road, for instance. 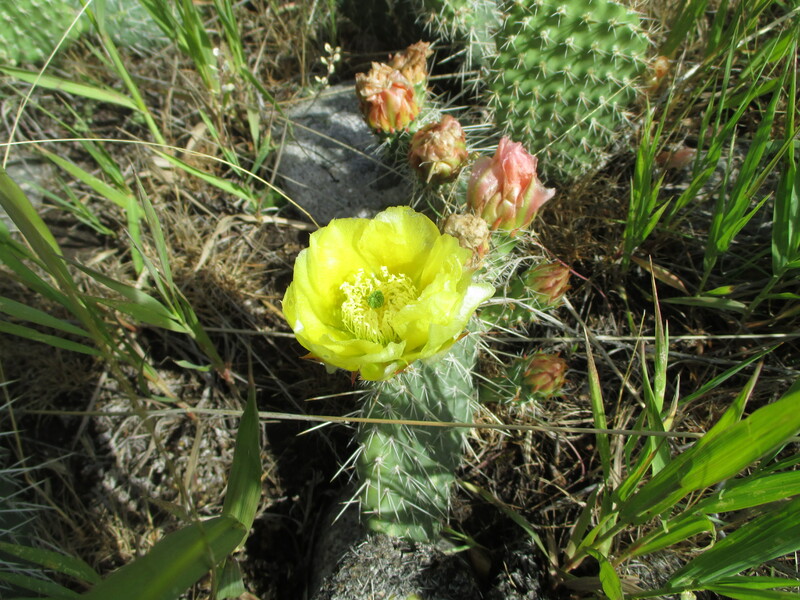 But, as I said, Kathi and I were there looking for wildflowers and wild plants. One of the things that both of us noticed is how many plants were thriving on the hillsides, even this late in the year. The most beautiful grouping of flowers we saw, in yellow, white, purple, pink, and green were between Potrerillos and Las Trojes, but unfortunately my camera had conked out by then because (1) it’s old, and (2) I’d taken a few too many photos at the cemetery just outside of Potrerillos. Kathi and I hadn’t planned to go there at all. Heck, let’s admit it, we didn’t even know the place existed. But as we drove over to take a look at the main church (templo), we both saw the panteon (cemetery) in the distance. We were both gobsmacked by the number of monuments or mausoleums in the place, so we HAD to go over and check it out. And, friends, we were even more gobsmacked (I love that word) when we got there! All along the way from the gates were these brick pyramids with upside down pots on them. I have no idea what that’s supposed to mean, but I’d like to know. It was the panteon itself that kinda freaked Kathi and I out that day. They were all so elaborate. And most of them said “Property of….” Usually around here, we just see family names on tombstones. I mean, this one has curtains! So make of it what you will. Happy Halloween and Day of the Dead. 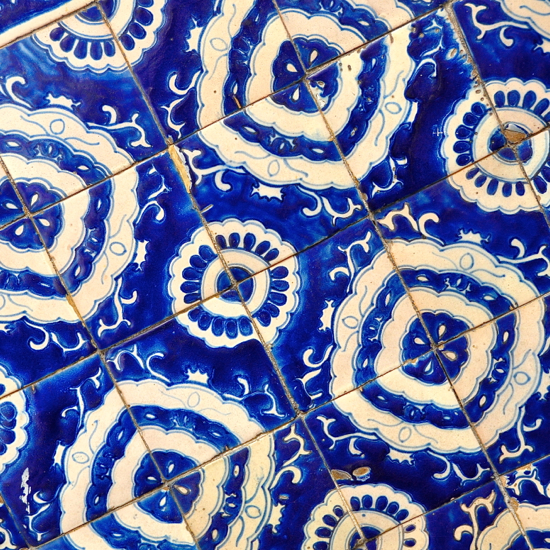 Tonala is known for ceramics, pottery, and glass objects, many of which are made on-site or thereby and thus are less expensive than the same items elsewhere. And on Thursdays and Saturdays there is a tianguis (open market) in Tonala that offers even more goods. A couple of years ago, fairly close to Christmas, some friends and I went up to check out the tianguis and I was amazed by the number of beautiful things for sale and also by the crowds. My friends vowed never again to go to Tonala on tianguis day. It was a mad house! The sidewalks were so crowded that I almost never stopped moving for fear of being mowed down and trampled to death (literally), but I wanted to take photos so these were, for the most part, point-and-shoot (again, literally). I probably took 400 photos that day, but the nice thing about digital cameras is that you can do that and not spend a fortune on film. So here are some of the pictures I took that day. I’ll let most of them speak for themselves because they are self-explanatory….but cool! And, yes, up to and including the bathroom sink! And they’re contained in a little vase for which I paid maybe $2.00US and which is made of recycled materials in Tapala, Jalisco, up in the mountains of Jalisco. But my real “find” in Tonala that day was this spoon holder for 25 pesos (again, about $2.00US). It sits on my counter and gets used pretty much daily and washed equally often and yet still retains all its color. A wonderful purchase from Tonala! I know that one of the things that folks like on blogs are photos. 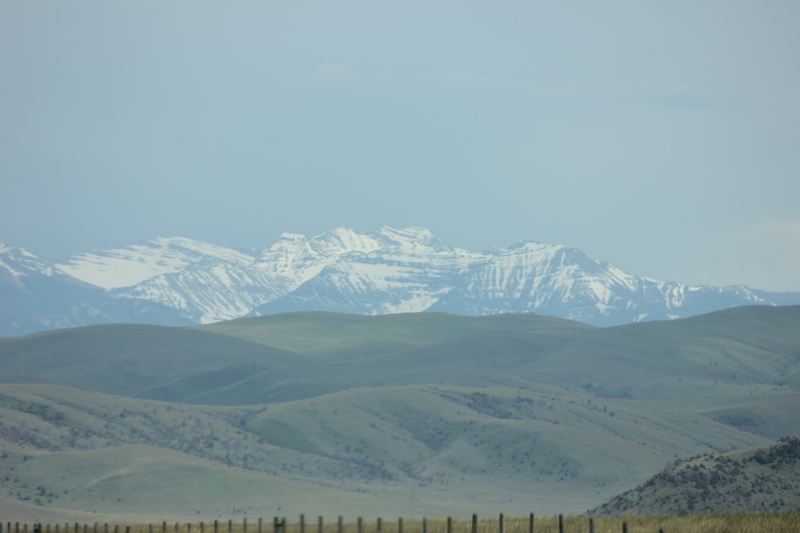 I haven’t taken any new ones lately because my camera is not working, but I did realize that I have some that you may not have seen before and might enjoy…..and which hopefully you will be able to see! You’ll also perhaps remember that when my friends Linda and Ric were visiting me in June of this year, we spent some time up there. Some things there have changed, but much is the same. And here are some photos that I shot of Jocotepec (my Mexican home town) not long after I got here. Again, it’s pretty much the same, although the trees around the plaza have grown up quite a bit. From this, you can see that Joco was “officially” founded in November of 1529 (yes, folks, FIFTEEN ninety-five), and that certain things have always been important to the locals. I presume that the rippling lines at the bottom of the seal represent Lake Chapala, where Joco sits on the far western end, and the corn in the upper right-hand corner show the importance then and now of agriculture to the area. Ja ja ja! And have a good day, my friends! 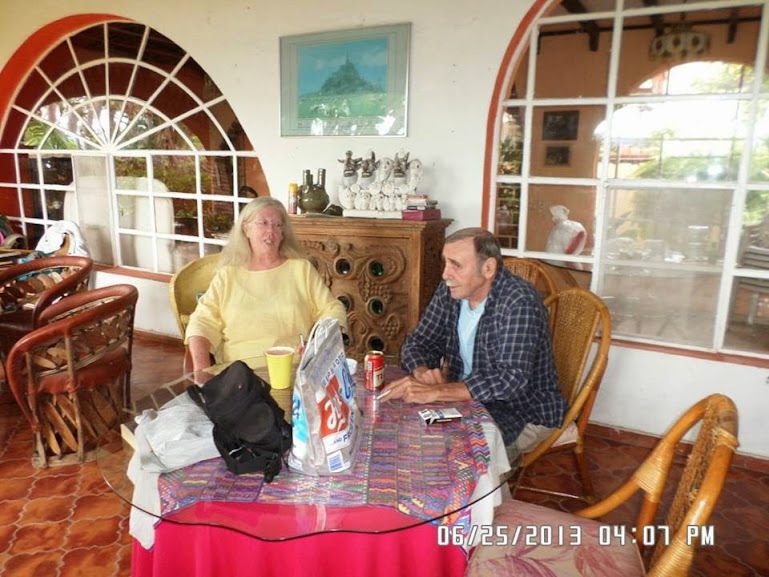 Monday I accompanied my friend, Phyllis, the owner/operator of Los Dos B&B here in Jocotepec (http://www.tripadvisor.com/Hotel_Review-g667915-d504475-Reviews-Los_Dos_Bed_and_Breakfast-Jocotepec.html) to a hospital in Guadalajara for a test she needed to take. Phyllis has been with me many times to the IMSS hospital in Tlajomulco, so when she asked me to accompany her, I was more than happy to do so. Phyllis certainly didn’t need my translation skills like I always need hers. She’s perfectly fluent in Spanish, having lived in Mexico for 40 years, but she wanted someone to drive her home to Joco after her heart had, literally, been set aflutter by the test. So she picked me up at 9am, and off we went. And 7-1/2 hours later, I got home. My question is this: Is this only a Mexican thing? Spending an entire day just doing a couple of things or running a few errands? Or maybe it’s an old people thing. Either way, it happens to me a lot down here Joco way, especially when I’m with a friend. I can’t remember the last time a friend and I went anywhere and were back in less than five hours. And that’s when we basically had no plans! 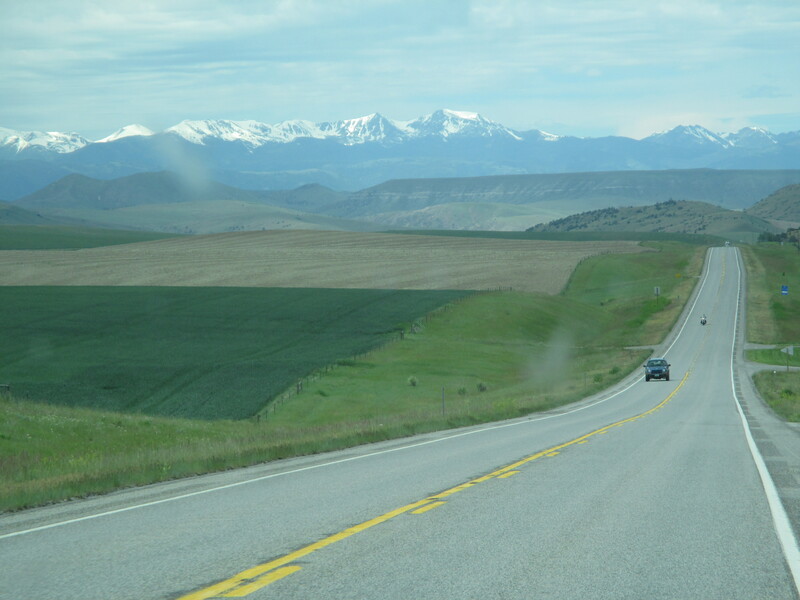 Yet when I worked in the US National Parks where it was often a 25 mile drive one-way to the nearest grocery store, I don’t remember it ever taking me anywhere close to five hours to do my errands. So, what’s up with that??? I mean, I know I don’t walk as fast as I used to, but I’ve always been much closer to the speed of the tortoise than the hare, so I don’t think that explains it. I swear I don’t remember spending six or seven hours just doing errands! But, honestly, I also don’t recall doing errands with friends nearly as often as I do down here. So perhaps that explains it. My father had a saying about hiring young fellows to work for him: “One boy is one boy; two boys are half a boy; and three boys are no boy at all.” Meaning that the more of them you got together in a group, the less work you got out of them. I think it may be kind of the same thing with me: “One Barb is one woman; Barb plus any other friend or friends is no Barb at all” (in the shopping sense, I mean). Apparently, I lose all sense of time when I have a friend with me, and not just because there are two of us shopping. I don’t stroll casually with my friends, cart next to cart or shopping bag next to shopping bag. We go our own ways in big stores and even on Morelos, our main shopping street in Joco, agreeing upon where to meet when we are finished. And yet it takes us HOURS. One reason that I AM aware of is that when I’m with a friend, we need to incorporate lunch into our plans. It’s often the highlight of the entire errand-running trip. Something to look forward to. Paying the phone bill or going to the ATM or buying pet food doesn’t hold a whole lot of appeal, but, hey, throw lunch with a friend in and you got yourself a social occasion! So as I typed that, I realized that I probably had my answer to why it takes so long to do my errands with friends. It’s not just errands with friends, it truly is a social occasion, even though it wasn’t planned as one. I’m not sure who the usual clientele of this place are (the only other diners were two older Mexican fellows), but the young waitress (and probably the cook’s daughter) was suitably impressed when I pointed at the poster and she said “Pink Floyd” and I said “Dark Side of the Moon.” (All of that in English, by the way, since musical group names, albums, and song titles from American or English artists are always pronounced in English, just like folks in the U.S. and Canada would pronounce Los Lobos or Enrique Iglesias in Spanish). WOW!!! What a concept! First of all, a big grocery store on the second floor? And second of all, escalators that transport you and your shopping cart hands-free? I LOVE that!!! And apparently Phyllis loved Mega! She discovered that their fruit/vegetable section had all sorts of things she might like, as did their bakery…..and apparently their other sections as well. I don’t know what she purchased, I only know that I was sitting down in the “breezeway” of the covered parking area for quite a long time before she showed up! So, although the trip yesterday was “medical” in nature, it somehow turned into one of those errand-running, social-occasion trips that always startle me by the amount of time they take. I was making comida for myself today and thinking about some of the e-mails I’d read and a conversation I had the other day with a woman newly moved to Mexico and I realized that no matter how much I love it down here (as do some of my friends), it’s not for everyone. The woman I met the other day was complaining about how noisy it is down here. She said it was so loud that she couldn’t sleep. Now this is a woman from a large city in Canada, who worked and lived therein. So I have to believe that the “noises” she’s hearing down here are not necessarily louder, just different. But she’s only been here a few weeks and her heart is set on moving to Arizona, so I doubt that she will become a permanent resident. Heck, she’s housesitting for a friend of mine and she was complaining because my friend’s very small dog snored too loud. Not a good sign for an ex-pat! You need to go through all the seasons (dry, rainy, cold, spring) before you can decide if Lake Chapala is the place for you, and preferably live in several different areas. And that’s probably true for any place you might want to live anywhere in the world. But folks too often just don’t do it. You also need to keep in mind that, as an expat, your native language is likely not the same and that you’re frequently gonna have a heck of a time communicating with people. Oh, sure, it’s easier down here in the communities around Lake Chapala because we have an inordinate number of expats, but the more kilometers you get away from Ajijic, Riberas, or San Antonio, the less likely it is that you’ll find somebody who speaks English when you really need it. And by that I mean in a doctor’s office, or at a mechanic’s, or at a repair shop. Same thing in the U.S. If you’re a native Spanish speaker and find yourself in a hospital in Phoenix or East L.A., I’d say you’re a lot more likely to find a translator than you are in, say, Minot, North Dakota (and I just randomly chose Minot, by the way). So if you’re thinking of moving down to Mexico, it would behoove you to learn as much Spanish as you can before you come. I didn’t do it and it’s come back to bite me numerous times. Something else you need to be aware of if you’re thinking of moving to Mexico are the laws pertaining to visas and vehicles. If you move to Baja and/or somewhere close to the border, the laws may be more lenient, but if you’re coming further south than that, you need to know what’s required. While the laws may change, they’re pretty clear….unlike those in the U.S. for immigrants, which seem to vary by state. I’d recommend that you check out Rolly Brook’s website for more information: http://www.rollybrook.com/. Personally, I love living in Mexico and in Jocotepec in particular. I think that’s pretty obvious from all my previous postings. Infrequently, I want to knock my head against the wall because of some bureaucratic stupidity, but I wanted to do that much more frequently in the U.S. The longer I live here, the more I love it. In the meantime, why don’t you come down for a visit and see if it’s for you? Well, Karen and Michal, coincidentally, I too have a chili story or two! And, yes, Karen and Michael, we do have all them kinds of chiles down here, I think! Although even in Jocotepec, you’d have to search around. We mostly have sweet chiles (green, red, and yellow), serranos, poblanos, and jalapenos. But I have definitely see bottle habaneros here…..I just run away from them! One thing we don’t have too much of here, except during the Chili Cookoff in Ajijic, is chili! It’s just not served here. Kind of like tostadas and enchiladas. You can find them, but you have to look for them. Sure, you can make them look like that, but don’t expect them to come like that. Tostados are shells upon which one builds, not the completed building (so to speak). And as for enchiladas, you need to find a Tex-Mex restaurant to get what you might be expecting. Some place like El Sarape in Ajijic that even advertises itself as serving Tex-Mex. 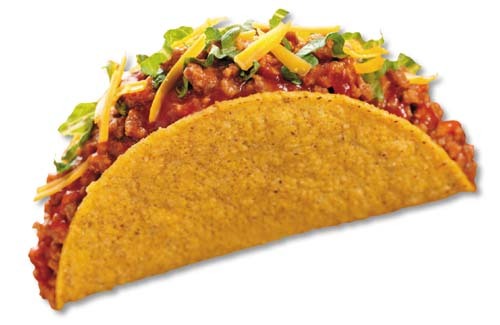 All delicious, but not your Taco Bell taco. There are, as I mentioned, a few restaurants where you can get a bowl of chili, but they’re places that cater mainly to gringos. My favorite chili comes from Gossip’s Cafe in Ajijic. They actually “specialize” more in Cajun-type food, but their big bowl of chili is delicious and just spicy enough for my taste, which is a little on the hot side. 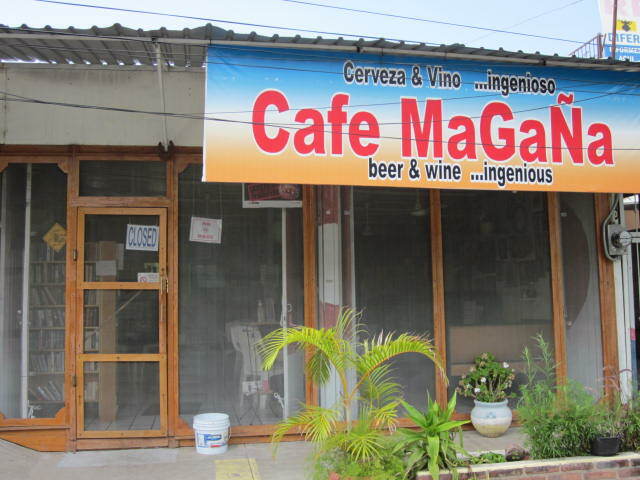 A couple of weeks ago, for my friend Warner’s birthday, we went to dinner at my favorite “library,” Cafe Magana, in the pueblo of Riberas del Pilar. I’ve written about it before. Aside from being a really good restaurant, they have a huge selection of books for swapping. You bring one in and you choose another to take home. (Although, honestly, I always bring in 15 to 20 and take home about the same amount since I read so much.) 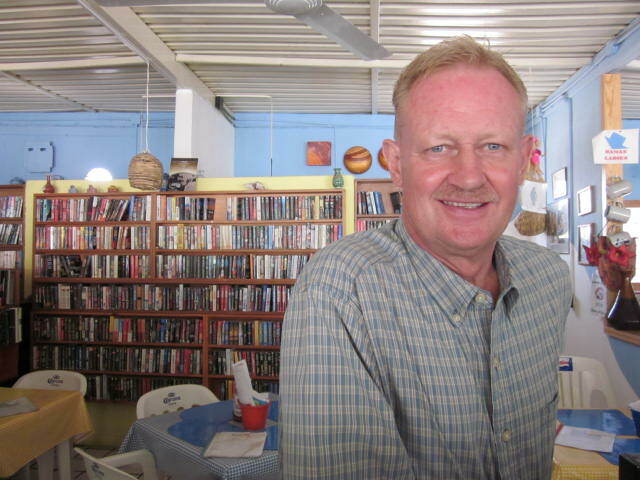 Here’s Jeffrey, the owner, in front of just a few of the many bookcases in the place. Anyhow, Jeffrey serves a VERY spicy bowl of chili. There are warnings on the menu and in his print advertisements that the chili is very hot and that he doesn’t want to hear any whining about it if it’s too spicy for you. Since, to my knowledge, Jeffrey does not exaggerate about this, I’ve never had the nerve to order it, but Warner loves hot food, so for his birthday dinner, that’s what he had. But by about the third spoonful at Cafe Magana, Warner’s nose was running, his eyes were watering, and he was frantically signaling for another beer! That’s when I became even happier that I had ordered my favorite from Cafe Magana: fish and chips. Nonetheless, after I got home that night, I started craving chili. Not as hot as Warner’s, obviously, but rather spicy. I fought the craving for a few days and then caved. You know how it is. So when Kathi and I went shopping last Monday, I bought half a kilo (1.1 pounds) of ground beef at my favorite carniceria here in Joco and whipped myself up a batch (or whatever you call a bunch of chili). I had the very low-fat ground beef (not intentionally….that’s just the way ground beef comes here) and the right spices (cayenne pepper, salt, chili powder and garlic), but I was lacking the tomato paste that most recipes call for. Tomato paste, like cheddar cheese, is difficult to find here. I figure the cheddar cheese shortage can be blamed on Mexicans liking white cheeses better, but the lack of tomato paste I can only attribute to the fact that tomatoes are generally so cheap around here that none of my neighbors would even consider buying a CAN of tomatoes in that form. However, we do have (even in Joco) a rather large selection of canned and bottled salsas and I figured that would do great as a substitute, plus I’d be getting some onions and cilantro. My personal favorite is Herdez Salsa Casera, so I purchased a couple of little cans of that and dumped those in, too. My chili looked fabulous as it simmered on the stove top and smelled so good that one of those cartoon ghostly fingers seemed to call me to it! So I whipped out a bowl, ladled in a large amount of the chili, and commenced to eat. And, then, just like Warner, my nose started to run, my eyes started to water, and, had there been a waiter nearby, I would have been signaling frantically for another beer. Now I don’t know if we get more sensitive to spicy foods as we get older or whether the substitution of Herdez salsa for tomato sauce did it, but I do know that my entire body was in rebellion against this chili!! SOMETHING MILD, it screamed. GET SOMETHING MILDER INTO ME NOW! It was almost as bad as that night in a fancy restaurant that I took up a forkful of what I thought was guacamole and turned out to be wasabi! But at least this time I was alone in my house and didn’t have to grab the elegant water pitcher on the table and drink it down while my date said, “Er, what the hell is going on with you?”. And, P.S., if you care, my saving grace this time was beans. I dumped in a huge can of black beans and all was right with my world again. The frijoles negros enteros saved the dinner….and the next four days while I ate chili every day! When it comes to high-octane food, there’s nothing with more oomph than chile peppers from the Genus Capsicum. When you’re looking for a little extra sizzle for your vittles, these culinary gems offer a wide range of heat-enhancement options. That heat is caused by the chemical capsaicin, and is measured in Scoville Heat Units (SHUs) which range from a “zero” in bell peppers (thanks to a recessive gene that eliminates the heat) up to others that range into the millions. Now that’s some hot stuff! Visit the Big List of Peppers on Cayenne Diane’s blog, and you’ll find something like a gazillion peppers (with “cool” names like Devil’s Tongue, Trinidad Scorpion, the Naga Viper, the Carolina Reaper, and the Madame Jeannette, named after a famous Brazilian prostitute) there, along with great photos, descriptions of the peppers, and their accompanying Scoville units. You’ll notice that the current hottest pepper in the world is the Trinidad Moruga Scorpion (until 2012, the hottest pepper was the Ghost Chili), and its Scoville units are over two million. Don’t think I want to try that one! (Nor do I ever hope to be in the path of the five million units of law enforcement pepper spray and hope I never have to use my three million units of bear spray). Why are we humans so intrigued by the heat in hot peppers? Maybe ’cause it “hurts so good.” Eating peppers (or spreading ointment with capsaicin on arthritic knees) causes the body to release endorphins, our natural pain reliever, and create a little “high.” And, oh yeah – there are studies that show that peppers are heart-healthy for us by lowering cholesterol and reducing blood pressure. And there’s mounting evidence that hot peppers are helpful in the treatment of some cancers. The downside? Other studies show that they can perhaps contribute to gastic and esophageal cancers. For us, maybe it is the endorphin thing, but, whatever the reason, we’re big fans (in small amounts) of the habanero (100,000 to 350,000 Scovilles ….. contrasted to the 20,000 SHUs in those jalapenos in your salsa). 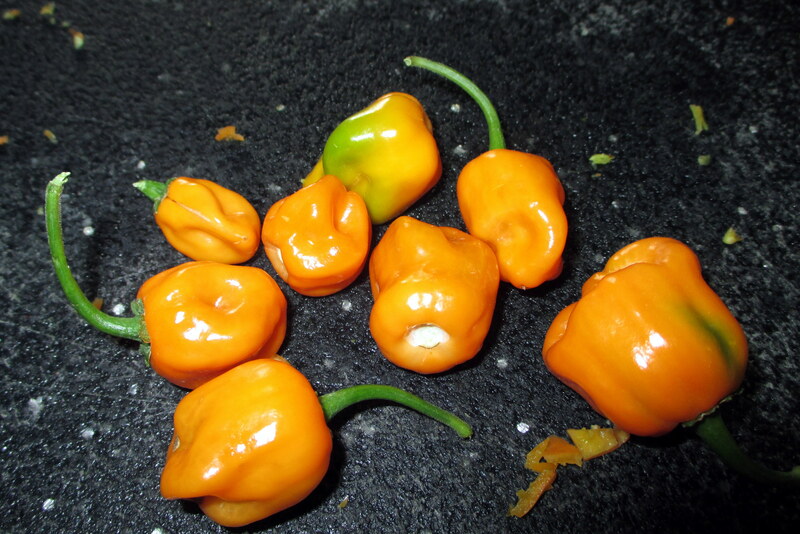 Despite the incredible heat, habaneros have a fruity after-note, and, well, we just like ’em. And our favorite use of this lovely little pepper is in hot pepper jelly. 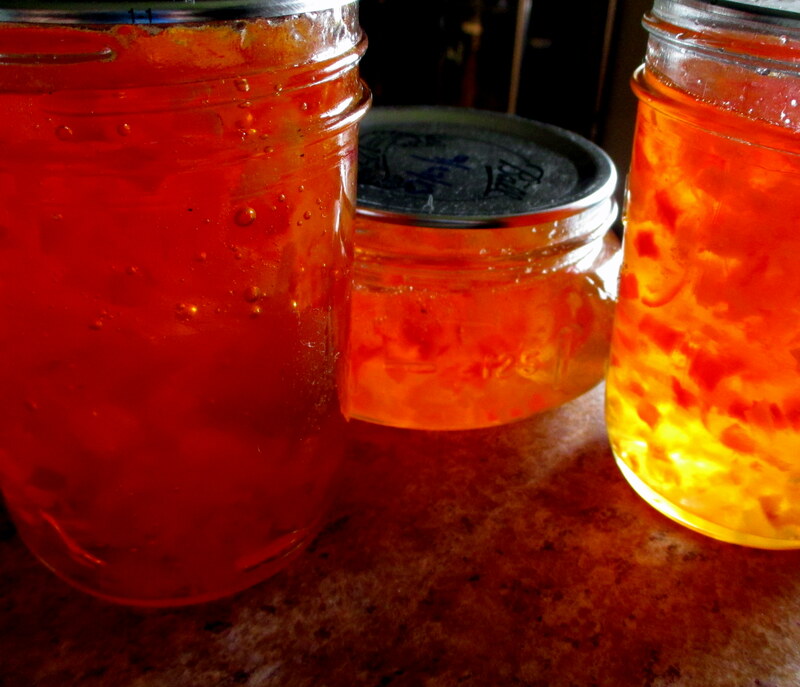 Last summer, our habanero crop was extremely fruitful, and we made some habanero gold jelly. And then we started eating it (and couldn’t stop) and giving it away, and, well, we were out of the precious stuff by mid-winter, so we plan to be (only a little) more frugal with its use this winter. So, if you’ve got a great crop of habaneros – or your farmers’ market is overwhelmed with them – try your hand at a batch of two of this great gift from the garden. And Barbara, we’re curious – can you buy habaneros in your markets or stores? How about some of those weapons-grade Viper or Ghost Chili peppers? How about the peter pepper? We’ve been moderately successful at growing it here, but Cayenne Diane’s blog mentions that it’s mainly grown in Texas, Louisiana, and Mexico. So – any peters in Mexico, Barb? If you’re the habanero chopper, I can’t stress this enough – WEAR GLOVES! And if you’ve got a little sinus congestion going on, you’re in luck, because the fumes from just chopping will certainly clear up any issues there. 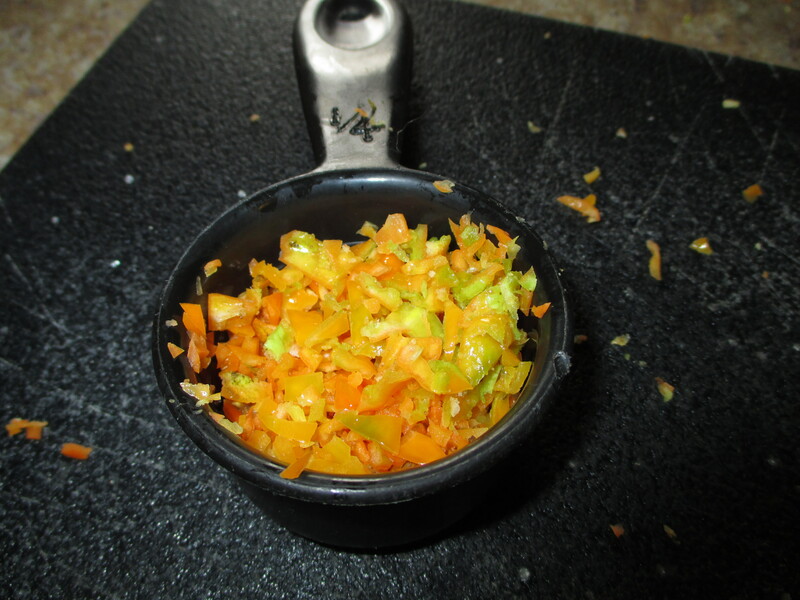 So, after you’ve donned your gloves, start by finely chopping peppers to make 1/4 cup. 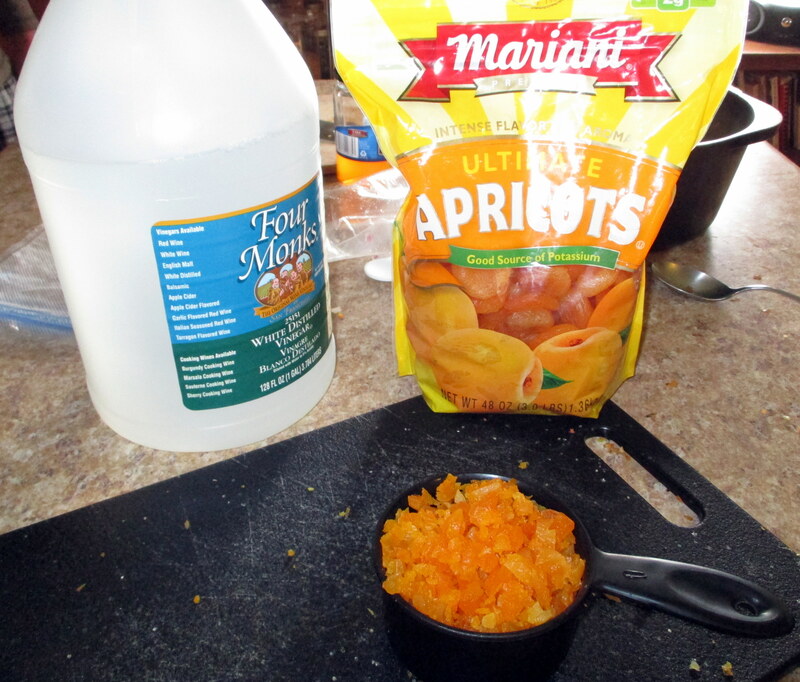 Next, finely chop up 1 cup of dried apricots. Apricots? I know, weird, right? But they add color, texture, volume, and taste. Now mix up a combination of minced red onions and sweet red pepper to equal 1-1/2 cups. Place the habaneros, apricots, and red pepper and red onions into a large pot. Add 1-1/2 cups white vinegar, and 6 cups sugar. Bring to a boil and cook for five minutes. Remove from heat, cover, and let sit at least 5 hours, or overnight. This helps the dried apricots absorb the liquids and all the flavors to meld. 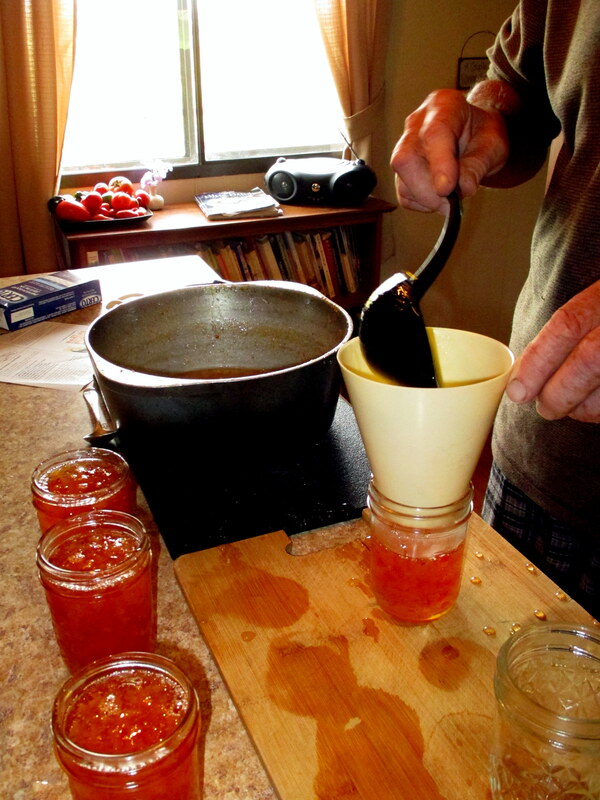 Start boiling water in a medium sized canner, and clean six pint jelly jars. 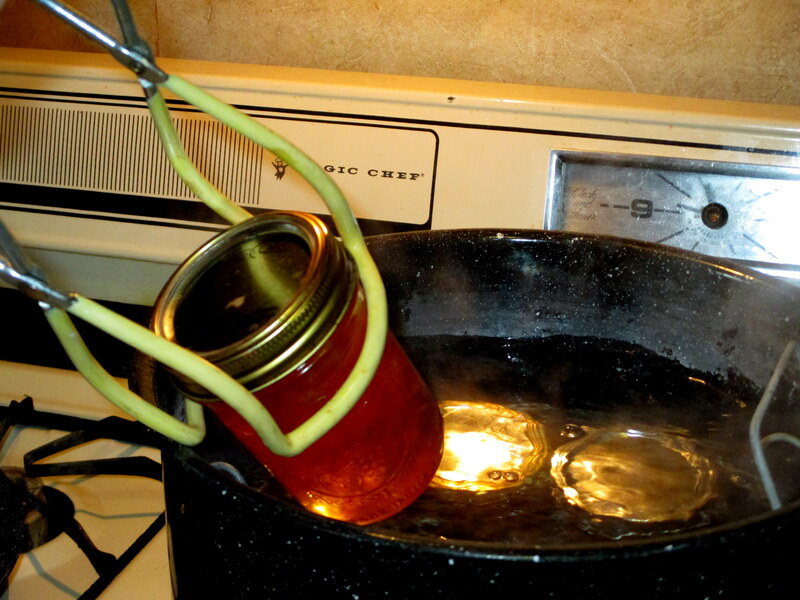 You can sterilize your jars in the boiling water bath in the canner. Also, pour boiling water over the sealing and screw-top lids and let those sit. Once your boiling water bath is close to boiling, put your pot of habanero goodies back on the stovetop and bring the whole mixture back to a boil. Stir in one 3-ounce pouch of LIQUID pectin. Boil hard for one minute and then pull off the heat. If there’s foam, skim it off, and let the mixture cool for two minutes. Pour into jars, seal, and process in that boiling water bath for 10 minutes (because of our altitude, we do 20 minutes). When the jars are sealed, agitate them a little to distribute the solids throughout the jars. They’ll look all pretty and stained-glassy. 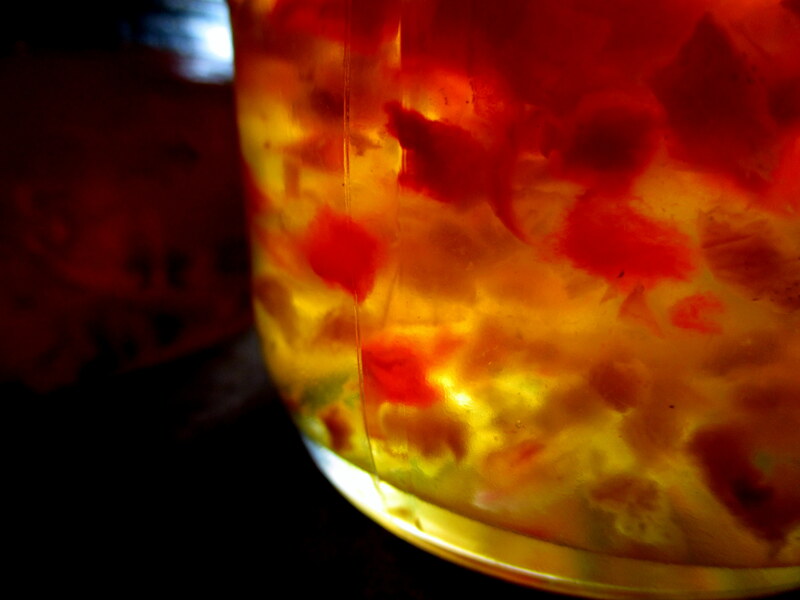 So, there you have it – the most excellent adventure of habanero pepper jelly. One note of caution – it’s pretty darn hot straight out of the jar. 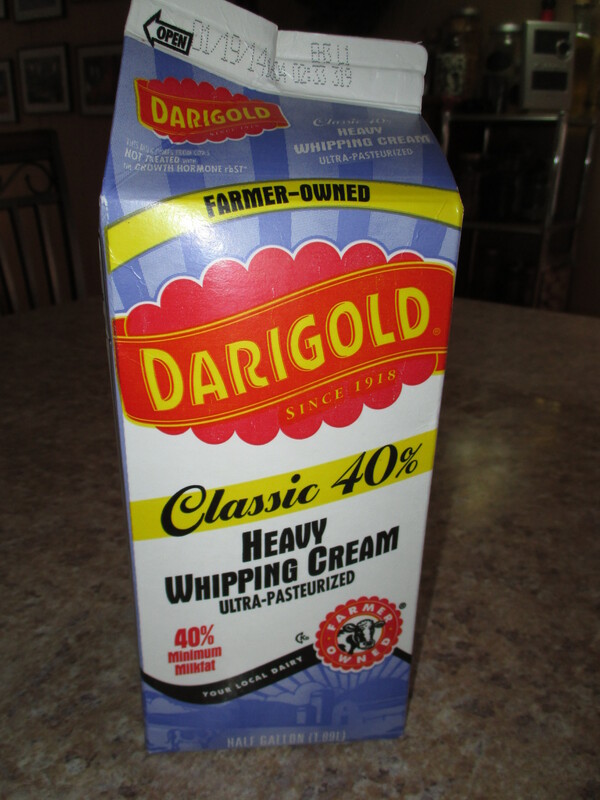 So, serve it poured over a block of cream cheese, with accompanying crackers, as an hors d’oeuvre. The cream cheese tempers the heat, making it perfect!